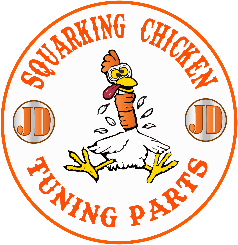 I have known Jimmy for over twenty years and have worked with him on more projects than I care to remember and if there is a more knowledgeable person on tuning Harley-Davidson engines I've yet to meet them. The horsepower Jimmy can extract reliably from Milwaukee's finest is nothing short of miraculous , from Sportsters to Big Twins nobody can get more power and offer it in a useable form , his engines aren't peaky with the power delivered in a short burst at the top of the rev range , from idle to redline you are pulled along by a wave of torque that you cant believe is coming from the same engine you gave him a couple of weeks before . His work is meticulous and he will not compromise on quality , everything he does is done with a level of detail that is often missed by other tuners , that's why he has won European awards for his work , and is recognised globally as an expert in his field. If you are serious about tuning your Harley and want the peace of mind that you are trusting your pride and joy to the best there is , you've found him. “We have been supplying specialised engine parts to Jim Norman for over 20 years now, and he is a valued customer. The attention to detail that goes into his engine builds is staggering as there is no compromise allowed. Paul Timpson - UK Sales Manager, Zodiac International.